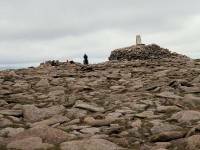 Cairn Gorm, altitude 1244m or 4081ft, is not the principal summit of the range but is the most well-known, being prominent in views from Aviemore and the nearby Spey valley. 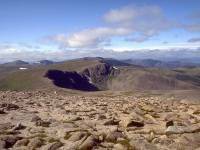 It is the one of the easiest high mountains in Scotland to climb. 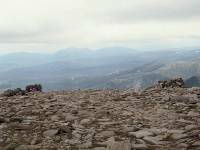 The road from Aviemore to the funicular railway on Cairngorm's northern slopes rises to 2000ft, and from there you can ascend by any one ot three routes from the base station; direct up the Sron an Aonach, or by the Fiacaill Coire Cas, or by using the railway's access track. 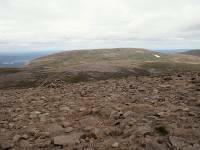 Beinn Macdui (4295ft), Britain's second highest summit, lies three miles south of Cairngorm across a magnificently wild and stony plateau which nowhere drops below 3500ft. Provided the weather is good the expedition from Cairngorm to Macdui is one of the simplest and most straightforward walks in the Higlands. But conditions like those seen in these images are uncommon. This plateau can be a killer. Unless you have plenty of experience in foul-weather walking in Scotland's mountains don't even think about attempting to cross the plateau unless the weather is fine and settled. This is, in my opinion, one of the most arresting views in Britain. We're looking slightly south of west from Cairn Gorm's summit, along the line of the "Northern Corries" that form the mountain's west ridge. In the immediate foreground is the headwall of the shapely Coire an t-Sneachda (snow corrie) with the Fiacaill ridge descending to the right. Beyond that is Coire an Lochain, topped by the summit of Cairn Lochain, which some feel should qualify as a seperate mountain in its own right. 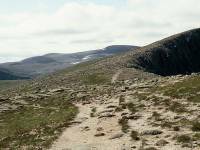 Beyond and to the left are Cairn Toul and Sgor an Lochain Uaine. 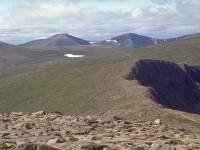 Braeriach, Britain's third highest summit, stands directly behind Cairn Lochain. To the right are the twin summits of Sgor Gaoith and Sgoran Dub Mor. A telephoto shot of the above scene, centred on Coire an t-Sneachda. Sgor an Lochain Uaine (sometimes called the Angel's Peak) is almost out of shot to the left; the plateau of Braeriach is the prominent top in the right half of the picture, with Cairn Lochan nearer to and immediately below it. The scene adjacent to the one above (keen image manipulators might try stitching these together!) We're looking across Coire an t-Sneachda to the Fiacaill ridge, with Coire an Lochain beyond. 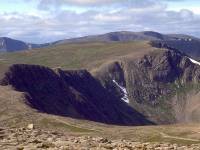 Braeriach now appears left of centre, with Sgor Gaoith behind and to the right. The Grey Corries range, some 50 miles away, appear behind the col to the right of Sgor Gaoith. Due south from Cairn Gorm, and we're looking across the snow-dappled high plateau of the central Cairngorm massif to the whaleback summit of Beinn Macdui, the second highest mountain in Britain at 4295ft. The east top of Stob Coire Sputan Dearg breaks the fall of the slope to the left, while the dark conical shape of Carn Etchachan stands out below and slightly further left. The prominent mountain on the skyline to the left is Carn am Righ. 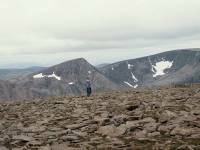 Cairn Toul (4236ft) and Sgor an Lochain Uaine (4127ft) appear as twin summits in this shot. 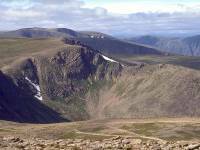 The so-called Angel's Peak was only recently recognised as a seperate mountain, having previously been regarded as a minor "top" of Cairn Toul. 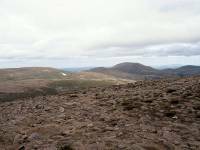 These two peaks are the fourth and fifth highest mountains in Britain; Cairn Gorm itself used to be fifth highest but is now demoted to sixth following Sgor an Lochain Uaine's elevation to Munro status. The slope falling away to the left from Coire an t-Sneachda is Coire Raibert (Robert's Corrie). 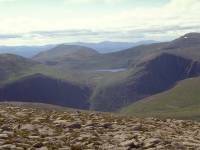 Loch Etchachan, in the centre of shot, is Britain's highest body of water of any real size. 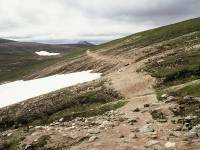 It lies at 3025 ft above sea level and is frozen for nearly half the year. Despite appearances it drains eastwards (i.e. to the left) rather than northwards (towards the camera). Stacan Dubha and Carn Etchachan flank it to the left and right on this side; Stob Coire Sputan Dearg lies behind to the right, while the breast-shaped Derry Cairngorm (3789ft) appears 4 miles away to the left. Loch Avon lies unseen in the trench in the foreground, which drops away from the lower reaches of Coire Raibert. The route to Macdui drops initially down the pathless summit dome to the southwest then follows this wide path between the gentle slopes of Coire Raibert on the left, and the lips of Coire Cas and then Coire an t-Sneachda to the right. The path climbs to the top of Stob Coire an t-Sneachda (1176m or 3850ft) and then descends again, still following the lip of the corrie. To the left now is Coire Domhain, seen here. 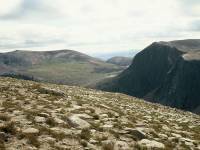 The corrie slopes down to Stag Rocks then falls dramatically to the head of Loch Avon. 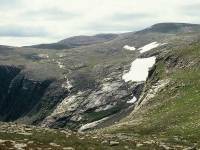 Carn Etchachan is on the far side of the corrie, with snow patches on its northern slopes. The light rocks below these are the Shelter Stone Crags. From pretty much the same spot, this is the view southeastwards with Carn Etchachan on the right and Beinn Mheadhoin on the left. 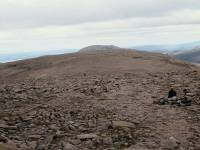 The terrain on the slopes of Coire Domhain is very typical of the Cairngorm plateau as a whole. The path divides now, with one branch continuing to follow the lip of Coire an t-Sneachda up towards Cairn Lochan, and this other branch heading off southwest across the plateau. 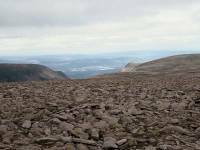 At some indeterminate point Coire Domhain becomes Coire Feith Buidhe; Lochan Buidhe, which the path skirts immadiately to the west at the col between Cairn Gorm and Macdui, is the highest named body of water in Britain at 1120m. It is frozen for more than half the year and today it was hidden under a snowdrift. The path pushes on for another 2km beyond Lochan Buidhe, across stony ground with the slopes of the Lairig Ghru to the right and the headwaters of the Avon to the left. The views of Braeriach, Sgor an Lochain Uaine and Cairn Toul across the Lairig Ghru are wild and dramatic rather than beautiful, while Macdui up ahead appears as a rather formless mass. The climb to its summit dome, however, is completely straightforward. 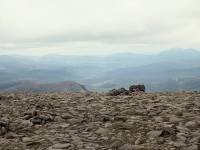 This is the view SE from the summit, the second highest mountain in Britain at 4295ft. We're looking across to the Glas Maol hills and Glenshee. South southwest from Macdui; Beinn Bhrotain and the great trench of Gleann Geusachan are seen, with the Glen Tilt Munros far behind. Southwest from Macdui, and here we're looking across the Lairig Ghru towards Cairn Toul (left of centre) and Sgor an Lochain Uaine (towards the right). The view due west from Macdui's summit; Sgor an Lochain Uaine is the shapely peak towards the left, while to the right the vast bowl of An Garbh Choire rises to the summit of Braeriach. 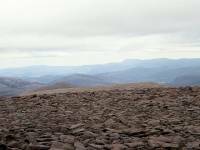 Britain's third highest mountain from its second highest; Braeriach (4252ft) has a summit plateau equally as vast as Macdui's. 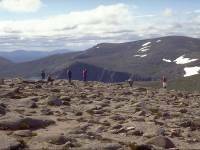 The view to the northwest; Aviemore appears within the dip formed by the mouth of the Lairig Ghru. 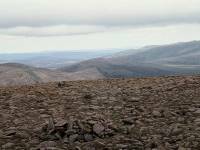 Due north from Macdui, acoss the vast bulk of the high plateau towards Cairngorm, three miles away. Looking eastwards across Coire Sputan Dearg towards Derry Cairngorm, with the slopes of Beinn a Bhuiridh some ten miles away to the right of the picture. The Lochnagar massif seen across the head of Glen Dee. 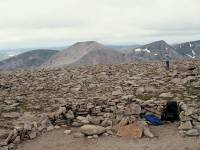 The trig pillar, wind shelter and topograph on the summit of Beinn Macdui. With the cloud getting ever lower it was time to head back. Cairn Lochan looks a long way away across the plateau. 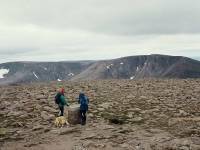 Dropping off the summit dome towards the dip of Lochan Buidhe, with the dome of Cairngorm beyond. The cloud began to drop rapidly after this and I took no more photos that day. 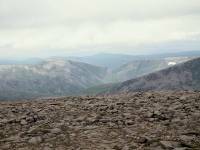 The cloud had enveloped the summit of Macdui by the time I reached Stob Coire Cas, and I contoured around the northwest slopes of Cairngorm to hit the chairlift for a rapid descent out of trouble. It was a cold wait for the bus at the chairlift base station.